Tennessee fans have been starving for a winning program in a major sport for a while. They finally got their wish with the men’s basketball team this year, and Vol fans supported that team in a big way. 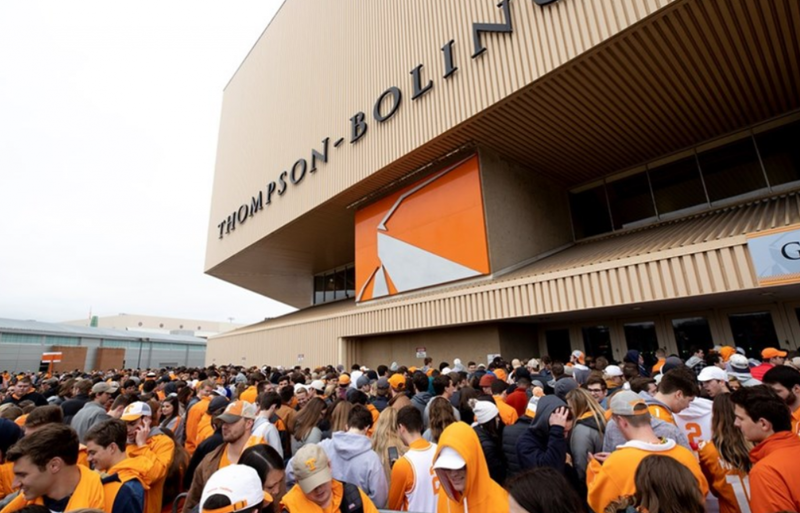 According to official numbers released by Tennessee’s athletic department, the Vols drew the highest average attendance total into Thompson-Boling Arena this season in nearly a decade. Tennessee had an average of 19,034 fans in attendance for home games this season, which finished in the top five nationally. That average is the highest in Thompson-Boling since the 2009-10 team drew an average of 19,168 per home game. Tennessee’s 19,034 average home attendance this season ranks as the seventh-best all-time in school history. It’s easily the highest in the Rick Barnes era, and it’s a massive jump from last season’s average of 16,210 fans per game in Thompson-Boling Arena. In fact, the 2,824 increase in average attendance from last season to this season is the second-largest increase from one season to the next in Thompson-Boling Arena history. The only increase that’s bigger is the last year of the Buzz Peterson era (2004-05) to the first year of the Bruce Pearl era (2005-06) that saw the average attendance rise by 5,729 fans per game. The Vols had five home games sell out this season, and they boasted an attendance of over 20,000 fans seven different times. Tennessee finished this season a perfect 18-0 at home, marking only the third time in school history that the Vols have gone undefeated at home since Thompson-Boling Arena opened up prior to the 1987-88 season. The other two instances came in the Bruce Pearl era. Both the 2006-07 and 2007-08 teams went undefeated at home, going 16-0 both seasons. The first year Thompson-Boling Arena opened is still the high water mark for attendance average in the arena’s history. The 1987-88 season saw an average of 20,823 fans attend home games that season. Just two years ago, Tennessee basketball had reached a low point in attendance that hadn’t been seen in over a decade. The 2016-17 season saw just an average of 13,637 fans attend home games at Thompson-Boling, the lowest average in a single season since the 2004-05 season had just over an average of 12,000 fans attending every home game. But the last two seasons have shown that if Tennessee puts out a winning product, Vol fans will go watch them in droves.